Choosing the right fonts to represent a business is a key element of branding; both online including website design, social media styling & offline for print design including marketing collateral such as stationery, adverts, brochure design, flyers etc. With the right selection of typefaces, branding can be more effective, recognisable and effectively convey a brand’s key messages to its target audience. The most important investment a business can make is in its brand, therefore it is imperative that the right fonts and design elements are selected, most importantly for the logo design itself. The typography in the design of your logo can be as impactful as a supporting graphic. Great examples of recognisable brands that use typography-based logos (logotypes) are ebay, facebook, Ray Ban, IKEA and Coca-Cola. When Metz Creative creates a logo design or refreshes an existing brand, selecting a typeface is an integral part of the graphic design process as it conveys the brand personality and continues to tell the brand story. 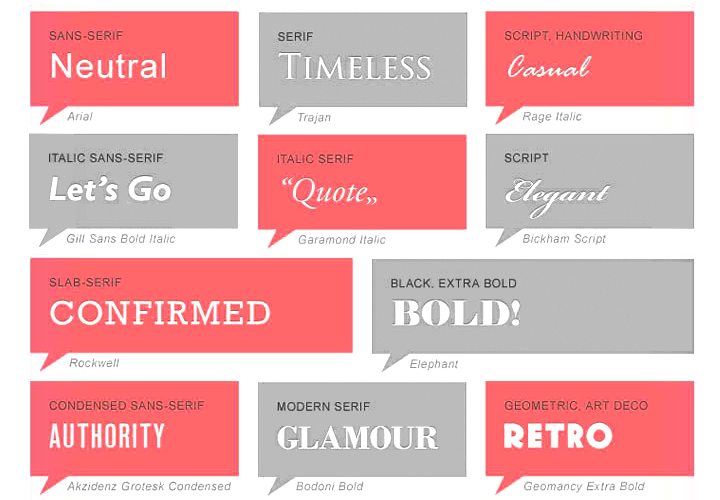 Fonts convey brand personality as well as the brand message. Should the brand be perceived as cutting edge and quirky or professional and serious? To keep a brand professional, Metz Creative recommends limiting the brand to two main fonts. This keeps the messaging clear to the target audience and shows the personality of the brand through two different type styles. Most fonts can be categorised as either sans serif or serif. The difference between the two types is that a serif font has ‘feet’ on the end of the characters, while sans serif fonts do not. Generally serif fonts are associated with being more traditional, respectable, impressive and reliable. Some classic examples are Cambria, Garamond and Georgia. Sans serif fonts are associated with being more modern, clean, universal. Some common examples are Arial, Calibri, Century Gothic and Helvetica. The website Fonts in Use (fontsinuse.com) holds an archive of fonts used on different creative formats across a wide range of industries. These project case studies are great examples of how a typeface can set the persona and tell a brand story through consistent styling of brand identity onto print design and web design marketing collateral.